It was an unlikely setting for a business meeting: the spectacular desert landscape of Jordan’s Wadi Rum. Flickering flames illuminated the faces of school leaders from around the globe. Above, a chilly night sky filled with the smoke of roasting lamb and the glimmer of previously unseen stars. 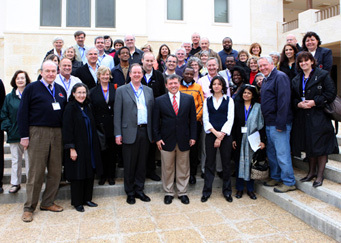 Our group, nearly forty-strong, toasted Global Connections’ visionary founder, Peter Pelham, and his wife, Isobel. We discussed provisional plans for next year’s conference in South Africa and Botswana. Malcolm McKenzie spoke of Global Connections’ three “I”s: Inclusivity, Internationality and Intimacy. Intimacy characterized our gathering at King’s Academy; an intimacy prompted by a program rich in speakers, activities and the sharing of ideas. We were briefed by leading authorities: Jordan’s Minister of Energy and Mineral Resources, Khaled Irani, Jordan’s Prime Minister, Samir Rifai, and – speaking of authority! – His Majesty, King Abdulla II. A lack both of water and regional peace poses the greatest threat to Jordan’s future prosperity. We learned that Jordan is the world’s fourth most arid country and that few nations stand to gain more from a negotiated settlement in the Middle East. “We’re at an all-time low,” said King Abdulla II, referring to the ongoing Israeli/Palestinian conflict. Nevertheless, His Majesty hopes to bypass politicians and appeal directly to the Israeli public, and to bring President Obama’s attention back to America’s core challenge of securing peace in the Middle East. Beyond the region’s turmoil and the determination of its dynamic leaders, we were introduced to a full range of Jordan’s most esteemed experts, enthusiasts and activists. Writer and photographer, Jane Taylor, gave an overview – quite literally – of this extraordinary land. Her images, taken from helicopters, gave us an appetizing hint of what lay in store for us at Petra and Amman. Archaeologist Dr. Barbara Porter showed us mosaic floors and intriguing double-headed busts in a broad ranging introduction to Jordan’s ancient treasures. Dr. Yasser Tabbaa illustrated the “hybridity” of Middle Eastern culture with, among many others, a striking example from Jerusalem’s Wailing Wall; he appealed for an “inclusive history” of Jordan and then shared the work of contemporary Jordanian artists whose work contains unmistakable critiques of violence and repression. Former CNN Baghdad Bureau Chief, Princess Rym Ali, spoke of her ambition to establish a first-rate journalism school in Jordan and of her dismay with media coverage that is often shallow and inaccurate. Princess Ali challenged us to train our students to be more critical news consumers, to question everything they see and to tap the work of many media outlets covering the Middle East. From the world beyond Jordan, we were inspired by the presentation of Barbara Goodwin-Zeibots and Barbara Galbraith, whose holistic Global Pathways project has given such hope to the people of Chettipalayam, India. We were provoked –some more than others! – by the words of Barnard College President Debra Spar, who proposed tough measures to tackle higher education’s addiction to funding annual costs out of endowment funds, now painfully diminished; a challenge many of us would love to have. We asked questions; we picked each other’s brains; we shared many good laughs. A steady flow of conversation unfolded against ever-changing backdrops: Madaba’s mosaics, Mt. Nebo’s vistas, Petra’s evocative ruins, Haret Jdoudna’s dining room and the Royal Automobile Museum’s collection of the late King Hussein’s private cars. We resisted earnest cries of “One American Dollar. Happy Hour!” We rode dangerously competitive donkeys; we vowed to watch Lawrence of Arabia again; we relaxed. For all of us, it was a relief to have others in charge, to be the ones cared for, to be students again. Malcolm McKenzie, for carrying forward Peter Pelham’s vision for Global Connections in his own articulate fashion. Eric Widmer, for his gracious hospitality and for convincing such distinguished former Deerfield students to address us. Arthur Clement, for his patient and unassuming assistance with all aspects of our journey. Abeer Nammari, whose superb organization and brilliant planning made possible this wonderful week of learning and camaraderie. Our guides, AV technicians, cleaners and cooks (especially the chef at King’s Academy) for extending such a warm welcome and rendering such kind assistance during our time in Jordan. And so until we gather again in 2011, perhaps around a warming fire in the African bush, we return to our schools filled with an appreciation both of Jordan’s beauty and its many challenges, renewed in mind and spirit and grateful for the affirming and intimate presence of our fellow educators.